↑ अ आ "AFC Asian Cup, match report: Japan 1–3 Qatar". The-AFC.com. Asian Football Confederation. 1 February 2019. अभिगमन तिथि 1 February 2019. ↑ "Abu Dhabi Bateen Airport, AE History". wunderground.com. Weather Underground. 1 February 2019. अभिगमन तिथि 1 February 2019. ↑ "AFC Asian Cup 2019 Competition Regulations" (PDF). Asian Football Confederation. अभिगमन तिथि 4 May 2018. ↑ Reedie, Euan (27 May 2015). "Zayed Sports City: In a league of its own". Gulf News. अभिगमन तिथि 28 December 2018. 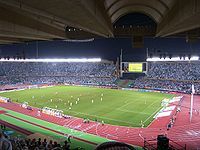 ↑ "Ultimate guide to the eight stadiums used at the 2019 Asian Cup in the United Arab Emirates". Fox Sports. 17 December 2018. अभिगमन तिथि 28 December 2018. ↑ McAuley, John (16 May 2018). "Al Ain ready to take on 'world class' teams after confirming place at Fifa Club World Cup". The National. Abu Dhabi. अभिगमन तिथि 28 December 2018. ↑ "Competition launched for 60,000-seat stadium in Dubai to host 2019 Asian Cup football matches". The National. Abu Dhabi. Reuters. 13 August 2015. अभिगमन तिथि 28 December 2018. ↑ Asian Football Confederation (23 January 2017). AFC Asian Cup UAE 2019 stadiums and match dates confirmed. प्रेस रिलीज़. Archived from the original on 5 April 2018. http://www.the-afc.com/competitions/afc-asian-cup/latest/news/afc-asian-cup-uae-2019-stadiums-and-match-dates-confirmed-34545. अभिगमन तिथि: 28 December 2018. ↑ "Qatar defeat Japan to secure first-ever Asian Cup crown". ESPN. Reuters. 1 February 2019. अभिगमन तिथि 1 February 2019. ↑ अ आ इ "Impressive Qatar beat Japan to win Asian Cup". FTBL. 2 February 2019. अभिगमन तिथि 1 February 2019. ↑ अ आ इ ई उ Krishnan, Joe (1 February 2019). "Asian Cup final 2019 LIVE: Japan vs Qatar commentary stream, TV channel, team news, line-ups, score prediction". Evening Standard. अभिगमन तिथि 1 February 2019. ↑ अ आ "Qatar stun Japan with 3-1 win to be crowned Asian Cup champions". The Guardian. Reuters. 1 February 2019. अभिगमन तिथि 1 February 2019. ↑ अ आ McAuley, John (1 February 2019). "Qatar win the Asian Cup with 3-1 victory over Japan". The National. Abu Dhabi. अभिगमन तिथि 1 February 2019. ↑ "Qatar win maiden continental title". Fédération Internationale de Football Association. 1 February 2019. अभिगमन तिथि 1 February 2019. ↑ "Qatar, Japan advance in Asian Cup with perfect record". Associated Press. 29 January 2019. अभिगमन तिथि 1 February 2019.